Although it doesn’t take up physical space, clutter on a computer can be a major drain on one’s time and energy! I’m not a huge picture-taker, but I do have a fair number of photos, and am not that great about naming the files and putting them into folders. Today I got the idea of making one file that’s like an electronic photo album. I could do one for my whole life; or do different albums for different periods of my life. Deleting the photos from my hard drive after making the album would be an option. Or copying the photos onto a memory stick and then deleting them off the hard drive. 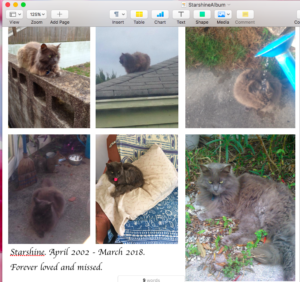 Here’s a page from “Starshine,” a little 2-page album of my favorite photos of my cat. She lived just about 16 years, and was such a sweet and joyful part of my life. She came to me as an abandoned stray in Austin, and made the move with me to Florida. She always was a good traveler. I created the file in Pages for Mac, but it would be easy to export as a PDF to make it more shareable if I wanted to.